Chicken bones stock reduces the inflammation of arthritis. Chicken bones extracts have been researched by Harvard Medical School scientists; the extract is a source of a protein, gelatine, and perhaps other substances, that stopped the pain and swelling in a group of 60 rheumatoid arthritis patients who had not responded well to conventional medical treatment. Of the 29 patients who took the collagen extract, 28 got significant relief, 4 of whom went into complete remission. The disease progressed in the 31 persons given a placebo. Dr David Trentham describes the technique as oral tolerisation, or teaching rogue immune system cells in the body to stop inflaming the normal joint tissues. It's interesting that there is increasing interest in many medical schools concerning the health benefits associated with good food, herbs, seeds and nuts. Arthritis relief is a major challenge to all the healing professions, including chiropractors; a chicken bones bouillon, rich in cartilage, is part of the solution, say researchers of this Harvard study. In this randomized, double-blind trial involving 60 patients with severe, active rheumatoid arthritis, a decrease in the number of swollen joints and tender joints occurred in subjects fed chicken type II collagen for 3 months but not in those that received a placebo. Four of thirty patients had complete remission. Cover the bones with boiling water and boil for one hour, together with a few pepper corns, and a couple tablespoons of apple cider vinegar to help with the extraction. You can also use the skin and the carcass, and any bits of cartilage, of the chicken. 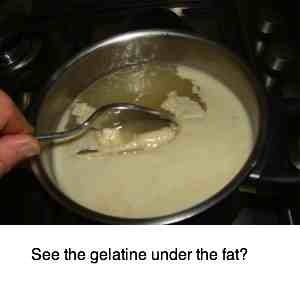 Pour off the gelatine rich stock whilst it's still hot. 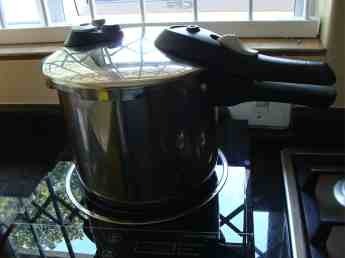 Add more boiling water and do a second extraction for say 20 minutes, and even a third if you want. The stock is rich in nutrients, calcium and the gelatine that will reduce the inflammation in your joints. Since returning to our native South Africa, with it's attendant energy problems, and new passion for a greener planet, I have revisited the making of our our chicken bones healing bouillon. A pressure cooker reduces the cooking time by two thirds; it also seems to do it more efficiently, so there is no second and third extraction; our dogs love the bones after I am finished with them. Plus, I do the extraction on a new induction countertop stove that uses less than half the energy of a conventional electric or gas hob. 4. Cool and refrigerate. Scrape the fat on the surface off. 5. Freeze your bouillon in cup size containers. It's very concentrated. This vegetable soup, using chicken bones stock, is one of our favourites. This bouillon is very rich; dilute it at least 50% with water. Gadgets new and old save us time and money, and reduce our carbon footprint. This broth makes wonderful soup. 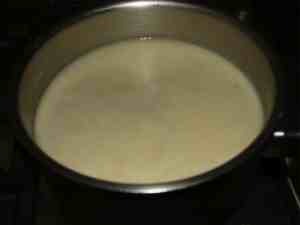 For example, this chickpea soup recipe is far tastier, and healthier with use of this chicken broth. You can if you choose put vegetables like onions, carrots, celery and a handful of a green in with the chicken bones. However, they are cooked to death by the time you are finished with them, and probably should also go to the dogs. 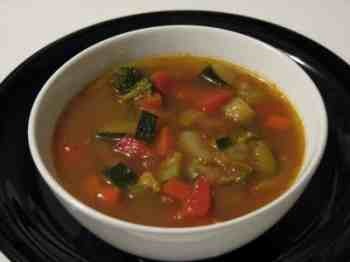 I personally prefer to make a concentrated stock, and then have fresh vegetables in with a soup. If you have serious arthritis inflammation and swelling, then you should be having at least some of this chicken bouillon in one form or another every day. There are serious concerns about the remnants of antibiotics, hormones and heaven knows what else in 'dem bones. There are also worries about what exactly is organic, and who polices those who use the term. But certainly some chickens lead a more normal and organic life than others. If you can find a source of chickens that have access to the open air, will recognise a cricket and an earthworm, then be prepared to pay a premium, and use these bones for your bouillon. Our hens above are enjoying a weekly gourmet feast from the worm farm; that's the best way to deal with your kitchen waste. Increasingly we are realising the importance of let your food be your medicine. Right now that means free range cage free eggs for us, and we are looking into rearing our own cockerels for truly organic hens. Quite apart from all the known fish oil health benefits the bones and the head of fish can be used to make an even better gelatine and glucosamine rich bouillon than from chicken, but with a little more trouble. The fat in fish is far healthier than that in chicken. Because this protein-rich extract from fish and chicken bones provides the desperately needed ingredients for cartilage repair, they are real chiropractic help! Do yourself a big favour and make it yourself. 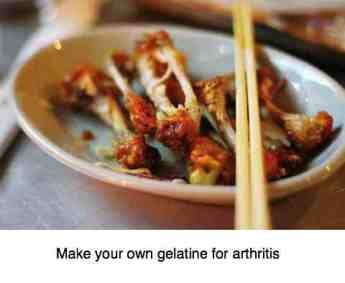 Gelatine powder for arthritis ... that's what's in dem bones. There's a dearth of convincing independent research proving that synthetic Glucosamine Chondroitin sulphate is anywhere near as effective. Plus your bouillon makes the perfect base for any number of soups. Read more about our tomato soup recipe … the best protection along with Selenium and Beta sitosterol for your family prostate! Broccoli, queen of the anti-cancer vegetables, Chicken broccoli recipe ... definitely one of our favourite soups, using our chicken bones bouillon. "People who count their chickens before they are hatched act very wisely. Why? 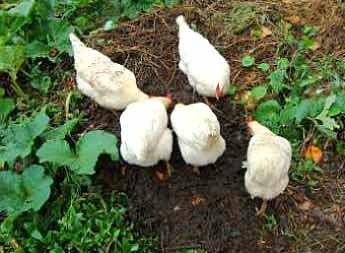 Because chickens run about so absurdly that it is impossible to count them accurately. " Everyone knows that mushrooms and chicken go so well together. Even more healthy is this delic, wholesome bouillon and mushrooms for the great nutritional content of mushrooms soup. My Mushroom soup recipes has to be one of my favourites, and for every male protecting your prostate gland is not without importance! Mushrooms are a great source of selenium that vital prostate mineral anti-oxidant. Every chiropractor is involved daily with treating conditions that involve swelling and inflammation; a chicken bones extract may undergird the treatment. Whilst it remains unresearched in the chiropractic paradigm, I would suggest that enjoying a healthy vegetable soup made with one of these bouillons would do much for your frozen shoulder or slipped disc; or the arthritis in your neck. You could even collect the bones from your friends and neighbours, though personally I only eat free range chickens. In fact, I'm considering starting a chicken tractor for our garden, though I'm far too squeamish to slaughter one of them! Best calcium for osteoporosis isn't chicken bones, but the bouillon contributes greatly to the collagen fabric that the calcium is deposited on. So it's great for a healthy bone structure, but not because of the calcium; that you have to get elsewhere. Best calcium for osteoporosis is from your food.